It’s nice to have a friend! 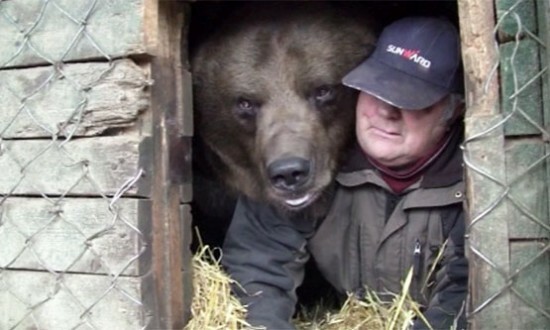 Juuso, a large brown bear from the Predator Animal Center, in Finland, only agreed to crawl into his shelter and hibernate, after his best friend tucked him in. With winter drawing ever nearer, Juuso, a young brown bear from Finland’s Predator Center, seemed tired. All the other bears had already began their winter hibernation, and Juuso’s eyes were closing all the time, but refused to go into his man-made lair. You’d think he was suffering from insomnia, but in fact, all he really needed was to be tucked-in by his best friend, caretaker Sulo Karjalainen. Sulo has been making sure the animals of the Predator Center have everything they need, and in turn, this ferocious creatures accepted him as a friend. To make sure Juuso gets some shut-eye during the winter months, Sulo went into the bear’s lair first, and his furry friend followed shortly. Happy and relaxed in the company of his friend, Juuso soon laid his head on his bed of straw, sighed and finally went to sleep. via Oddity Central – Weird Places, Odd Events, Bizarre News, Strange People and A Lot More – Part 5.